For the modern monarchy that lasted from 1948 until 1972, see Dominion of Ceylon. The Sinhalese monarch, anachronistically referred to as the kings of Sri Lanka,[N 1] were the heads of state of the Sinhala Kingdom, in what is today Sri Lanka. The monarch held absolute power and succession was hereditary. The monarchy comprised the reigning monarch, his or her family, and the royal household which supports and facilitates the monarch in the exercise of his royal duties and prerogatives. The Sinhalese monarchy has its origins in the settlement of North Indian Indo-Aryan immigrants to the island of Sri Lanka. The Landing of Vijay as described in the traditional chronicles of the island, the Dipavamsa, Mahavamsa and Culavamsa, and later chronicles, recount the date of the establishment of the first Sinhala Kingdom in 543 BC[N 2] when Prince Vijaya (543–505 BC), an Indian Prince, and 700 of his followers landed on the island of Sri Lanka and established the Kingdom of Tambapanni. In Sinhalese mythology, Prince Vijaya and followers are told to be the progenitors of the Sinhalese people. However, according to the story in the Divyavadana, the immigrants were probably not led by a scion of a royal house in India, as told in the romantic legend, but rather may have been groups of adventurous and pioneering merchants exploring new lands. The Sinhala Kingdom concerns the political states of the Sinhalese people and their ancestors; it existed not as one continuous state but has been historically referred to as a series of successive kingdoms known by the city at which its administrative centre was located. These are in chronological order: the kingdoms of Tambapanni, Upatissa Nuwara, Anuradhapura, Polonnaruwa, Dambadeniya, Gampola, Kotte, Sitawaka and Kandy. The kingdoms existed in what is today the modern state of Sri Lanka. The Sinhala Kingdom ceased to exist by 1815 with Sri Vikrama Rajasinha of Kandy after generations of European influences and upheaval in the royal court. During the two millennia in which the Kingdom existed, other political entities also existed on the island, including the Jaffna Kingdom, Vanni chieftaincies and the Portuguese and Dutch colonies. However, these political entities were not part of the Sinhala Kingdom. During the reign of Devanampiya Tissa (307–267 BC) saw the introduction of Buddhism to the country through Ashoka of India. By the time of Kithsirimevan (304–332), Sudatta, the sub king of Kalinga, and Hemamala brought the Tooth Relic of the Buddha to Sri Lanka because of unrest in the country. Kithsirimevan carried it in procession and placed the relic in a mansion named Datadhatughara. He ordered this procession to be held annually, and this is still done as a tradition in the country. The Tooth Relic of the Buddha soon became one of the most sacred objects in the country, and a symbol of kingship. The person who was in possession of the Tooth Relic thereafter would be the rightful ruler of the country. The role of the monarch was absolute, he was head of state but would be aided with high level officials and a board of ministers. The monarch was seen as the supreme ruler throughout the island, even at times when he did not have absolute control over it. They sought to establish control over the whole island, though in reality this was more of an aspiration. However periods of effective control over the whole island did exist from time to time. The monarch also held judicial power and influence. Judicial customs, traditions and moral principles based on Buddhism were used as the bases of law. The laws and legal measures were proclaimed by the king, and were to be followed by the justice administration. However the king was the final judge in legal disputes, and all cases against members of the royal family and high dignitaries of the state were judged by him. Though, the king did have to exercise this power with care and after consulting with his advisers. This article is a list of monarchs that have reigned over the nine successive kingdoms under the Sinhalese monarchy. It is based on the traditional list of monarchs as recorded in the chronicles of the island, in particular the Mahavamsa and Rajaveliya. It is not a list of ethnically Sinhalese monarchs as it contains all Sinhalese and foreign rulers who have reigned, chronologically and in succession, in the Sinhala Kingdom. Each legitimate monarch belongs to one of nine royal houses (Vijaya, Lambakanna I, Moriya, Lambakanna II, Vijayabahu, Kalinga, Siri Sanga Bo, Dinajara and Nayaks[N 3]), and follows a tradition of regnal names that span the entirety of the monarchy. For example, Vijayabahu was used 7 times over multiple kingdoms and multiple royal houses over a period of 500 years and there is no overlap of names, Vijayabahu I, II, III, IV, V, VI, VII. The same is true for Aggabodhi, Bhuvanaikabahu, Kassapa, Mahinda, Parakramabahu and others. The Sinhalese Monarchy has also been ruled over by foreigners from Southern India, which has occurred several times throughout the course of the kingdom's history. This is usually occurred through the usurpation of the throne. This list should be used with the following factors kept in mind. Firstly, the dates provided for the earliest monarchs are difficult to objectively verify; those particularly difficult to know have been denoted with a (?) mark. Also, the island of Sri Lanka has been invaded by many foreign powers over its 2500-year history, mainly from South India, and some seized the throne and made the island part of their empires. Most notable are the Cholas in 985 and British in 1815. The Portuguese and the Dutch, however, did not seize the Kandyan throne but only occupied territory within the island. It should be borne in mind that there is controversy about the base date of the Buddhist Era, with 543 BC and 483 BC being advanced as the date of the parinibbana of the Buddha. As Wilhelm Geiger pointed out, the Dipawamsa and Mahawansa are the primary sources for ancient South Asian chronology; they date the consecration (abhisheka) of Ashoka to 218 years after the parinibbana. Chandragupta Maurya ascended the throne 56 years prior to this, or 162 years after the parinibbana. The approximate date of Chandragupta's ascension is within two years of 321 BC (from Megasthenes). Hence the approximate date of the parinibbana is between 485 and 481 BC—which accords well with the Mahayana dating of 483 BC. According to Geiger, the difference between the two reckonings seems to have occurred at sometime between the reigns of Udaya III (946–954 or 1007–1015) and Pârakkama Pandya (c. 1046–1048), when there was considerable unrest in the country. However, mention is made of an embassy sent to China by Cha-cha Mo-ho-nan in 428. The name may correspond to 'Raja (King) Mahanama', who (by the traditional chronology) reigned about this time. 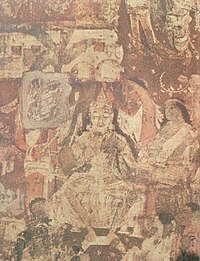 Furthermore, the traveller-monk Xuanzang, who attempted to visit Sri Lanka about 642, was told by Sri Lankan monks (possibly at Kanchipuram) that there was trouble in the kingdom, so he desisted; this accords with the period of struggle for the throne between Aggabodhi III Sirisanghabo, Jettha Tissa III and Dathopa Tissa I Hatthadpath in 632–643. Recent indological research has indicated that the Parinibbana of the Buddha may be even later than previously supposed. A majority of the scholars at a symposium held in 1988 in Göttingen regarding the problem were inclined towards a date of 440–360 BCE. However, their calculations were based on the chronology of Tibetan Buddhism, preferred over that of the Dipavamsa/Mahavamasa; the modified chronology, to work, needs to identify the Indian ruler Kalasoka, son of Susunaga, with the Emperor Ashoka, son of Bindusara. It should be noted that the Sri Lankan chronicles are based on even earlier works and that the Theravada Buddhist canon was first put into writing in Sri Lanka. The chronology of the following list is based on the traditional Therevada/Sri Lankan system, which is based on 543 BC—60 years earlier than the Mahayana calendar. Dates after c. 1048 are synchronous. Sena and Guttika - - 237 BC 215 BC Defeated Suratissa in battle. Lokissara - - 1210 1211 Leader of a Tamil army. After Kalinga Magha invaded, with the intent of ruling the whole island, the Kingdom of Polonnaruwa was sacked. This caused massive Sinhalese migration to the south and west of the island. Unable to capture the whole island Kalinga Magha establishes the Jaffna kingdom becoming its first monarch. The Jaffna kingdom is situated in modern northern Sri Lanka while the Kingdom of Dambadeniya was established by Vijayabahu III on the rest of the island in around 1220. In 1796 the British first entered the island and gained control of the coastal areas from the Dutch. After the Kandyan Wars and the signing of the Kandyan Convention in 1815 the island recognized the British monarch as Sovereign, ending over 2000 years of Sri Lankan indigenous monarchy. ^ The name Sri Lanka refers to the modern democratic state. ^ This is the most common date. ^ The Nayaks were not an ethnically Sinhalese royal house, nonetheless are considered a part of the Sinhalese monarchy. ^ "Anurādhapura". www.palikanon.com. Retrieved 27 February 2013. ^ "483 BC – Arrival of Aryans to Sri Lanka". scenicsrilanka.com. Retrieved 2009-11-06. ^ Cavendish, Marshall (2007). World and Its Peoples: Eastern and Southern Asia. Cavendish Square Publishing. pp. 350–51. ISBN 978-0-7614-7631-3. ^ De Silva, K. M. (1981). A History of Sri Lanka. University of California Press. ISBN 978-0-19-561655-2. ^ Manogaran, Chelvadurai (1987). Ethnic Conflict and Reconciliation in Sri Lanka. University of Hawaii Press. pp. 25–26. ISBN 978-0-8248-1116-7. ^ Malalgoda, Kitsiri (1976). Buddhism in Sinhalese Society, 1750–1900: A Study of Religious Revival and Change. University of California Press. p. 29. ISBN 0-520-02873-2. ^ Dias, M.; Koralage, S.B. ; Asanga, K. (2016). The archaeological heritage of Jaffna peninsula. Colombo: Department of Archaeology (Sri Lanka). pp. 183, 186. ISBN 978-955-9159-99-5. ^ Ray, H.C. (2016). University of Ceylon, History of Ceylon: Volume I (From the earliest time to 1505): Part II (From the Cola conquest in 1017 to the arrival of the Portuguese in 1505). Colombo: Ceylon University Press. p. 726. ^ Ratnatunga, Rhajiv. "LIST OF THE SOVEREIGNS OF LANKA". lakdiva.org. Retrieved 1 January 2018. ^ de Silva, K. M. (2005). A History of Sri Lanka. Sri Lanka: Penguin Books India. Retrieved 1 January 2018. ^ Gunasekara, B. (1900). The Rajavaliya : or, A historical narrative of Sinhalese kings from Vijaya to Vimala Dharma Surya II. Colombo: Government Printer, Ceylon. ISBN 81-206-1029-6. Retrieved 1 January 2018. ^ "The Mahavamsa: Original Version Chapters 1 – 37". Mahavamsa.org. Retrieved 27 February 2013. ^ a b Geiger (Tr), Wilhelm (1912). The Mahawamsa or Great Chronicle of Ceylon. Oxford: Oxford University Press (for the Pali Text Society). p. 300. Archived from the original on 2008-10-30. ^ Cousins, L. S. "The Dating of the Historical Buddha: A Review Article". indology. Retrieved 27 February 2013. ^ Codrington, Humphry William. "The Dambadeniya And Gampola Kings". lakdiva.org. Retrieved 27 February 2013. Dhammakitti; tr. Geiger, Wilhelm; tr. Rickmers, C. Habel (1212). Culavamsa: Being the More Recent part of the Mahavamsa (1929 ed.). Colombo: Ceylon Govt. Information Dept. tr. Geiger, Wilhelm; Bode, Mabel Haynes (1912). Mahavamsa : the great chronicle of Ceylon. London: Oxford University Press. Knox, Robert (1681). An Historical Relation of the Island Ceylon. London: Richard Chiswell. Blaze, L. E (1995). History of Ceylon. Asian Educational Services. ISBN 978-81-206-1074-3. Mittal, J. P. (2006). "Other dynasties". History of Ancient India: From 4250 BC to 637 AD. Volume 2 of History of Ancient India: A New Version. Atlantic Publishers & Distributors. ISBN 81-269-0616-2. Paranavithana, Senarath (July 1936). "Two Royal Titles of the Early Sinhalese, and the Origin of Kingship in Ancient Ceylon". Journal of the Royal Asiatic Society of Great Britain and Ireland (3): 443–462.